A hand-stamped card is often used to cheer up someone with struggles in their lives. Our Blessing Cards group meets once a month and we create hand-crafted cards that are used for just that purpose! We donate hand-made cards to many Ministries, Outreaches, Soldier Services (like For the Troops), Buddy Break (an outreach for children with various disabilities and their families) to Children's Hospital. Today I delivered a stack of hand-crafted cards that will be used to reach out to people who are in real need. What a joy it is to use my love of crafting for blessing and enriching the lives of others. JOIN US for the Free Card Event 'Blessing Cards' events on one Tuesday afternoon per month. These cards are used in a Church Ministry that sends encouragement to their members who are struggling or have had loss. They have a selection of scripture they use. This was one of the options that was needed. 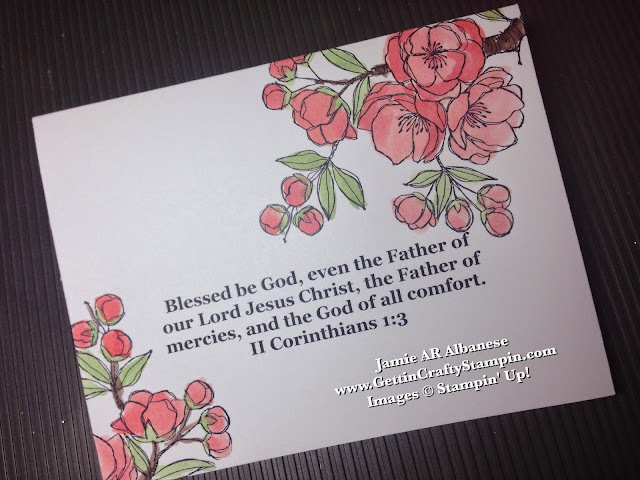 I simply printed them, two to a page, towards the bottom of the page for a perfect scripture look. 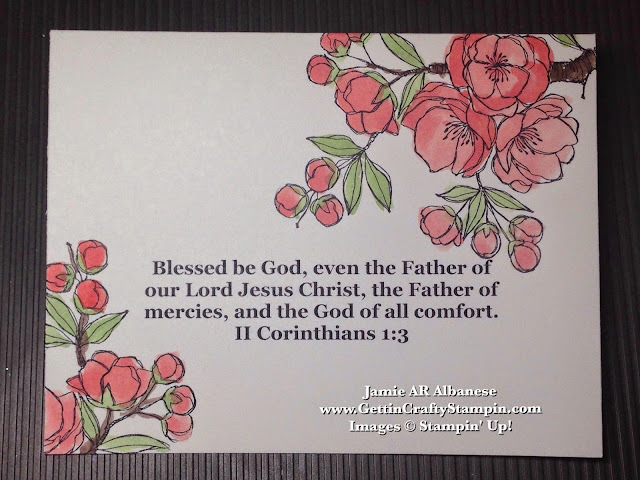 Stamp the new Indescribable Gift stamp set flower on alternating corners in Stazon Jet Black ink to frame the words. Add soft color when you Watercolor the flowers in with our Aqua Painters. Squish the lid into the ink pad to create a collection of ink and use this to paint the flowers, branch and leaves. The great thing with Water Coloring you do not have to be perfect! You can create layers and depth as well. Combine your passion for crafting and card making with your love of blessing others. A hand-stamped card is a small measure of love that delivers big blessings. I love that a simple donation of our hand-crafted cards will go out to cheer and enrich the lives of others. You don't have to be super advanced in technique to deliver a WOW card. Water Coloring is a fun and easy way to do just that. Go ahead, create and send some love in the mail - it's a wonderful way to brighten the day of another.